When improving your daily mobility requires heavy duty strength and durability, the Bariatric Rollator from Drive offers a full slate of features and a 400 pound weight capacity. Along with its increased weight capacity, the Bariatric Rollator is extra-wide between the handles for more comfortable use. 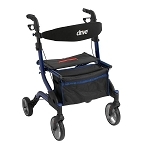 The 8" wheels make it great for both indoors and outdoors and its large padded seat provides a comfortable resting spot when you're on the go. 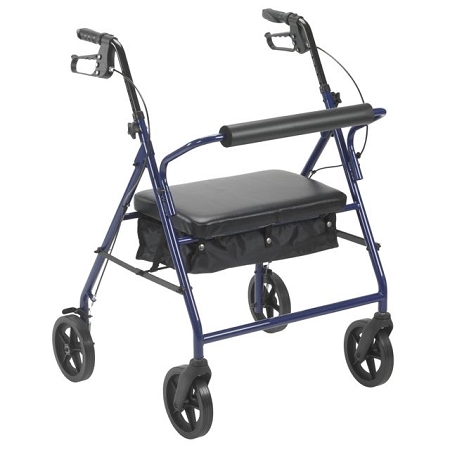 The Bariatric Rollator even includes a convenient basket for carrying items with you. 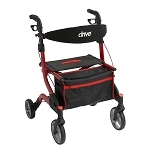 Enhance your mobility - and your quality of life - with the new Bariatric Rollator from Drive. Actual Product Weight: 23.50 lbs; Casters: 8"; Handle Height (Max): 39"; Handle Height (Min): 34"; Number of Wheels: 4; Overall Product Height: 34"; Overall Product Length: 27.5"; Overall Product Width: 24.5"; Primary Product Color: Blue; Primary Product Material: Steel; Product Weight Capacity: 400 lbs; Seat Depth: 13.25"; Seat Width: 19"; Seat to Floor Height: 22"